This article is a step by step breakdown on how to hide not available classes in Step 2 of the reservation process. This is useful if you have a long list of vehicle class. It will remove the vehicle class that has 0 availability from the list. To learn more about vehicle classes, click here. 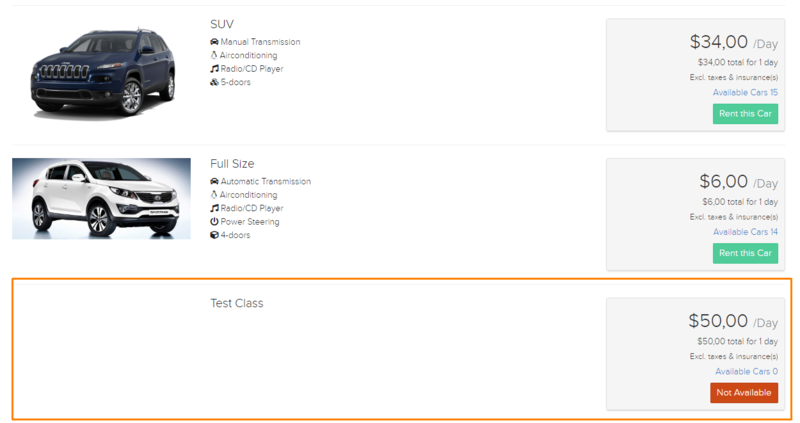 Secondly, select “Yes” under “Hide Not Available Classes on Cars Step” as shown in the picture below highlighted in orange. Now when you are on Step 2 of the reservation, if you have any not available classes, the system will not list them as shown in the pictures below for comparison. The picture above shows when it is not hidden and the picture below shows when it is.